Gaddafi is also wanted by the ICC for crimes against humanity – but David Cameron told reporters this morning there is “no confirmation” of Gaddafi’s whereabouts. British military intelligence – and in particular GCHQ, the signals intelligence agency – is understood to be monitoring his communications systems. Libyan Prime Minister Al Baghdadi Ali al-Mahmoudi and the head of the country’s television union, Abdallah Mansour, have escaped to the Tunisian island of Djerba. The most likely scenario, according to diplomats, is that he is holed up in his Al Azizya compound. Heavy fighting has been heard around the complex, which houses the Colonel’s tents, bunkers, command centres and villa. This morning shortly before 7am a tank emerged. One of his sons, Mutassim, was reported to be there this lunchtime. Abdel Salam Jalloud, the tyrant’s former prime minister who fell out of favour in the 1990s, told Italian TV Gaddafi is unlikely to commit suicide. “He’s not like Hitler, who had the courage to commit suicide, he doesn’t have that courage,” he said. Today the capital is buzzing with rumour as to where fallen leader might be – if he is still alive. Last night South African planes were spotted at Tripoli airport, leading to speculation Gaddafi would be granted asylum in Africa’s most powerful nation. But Maite Nkoana-Mashabane, the foreign minister, said he was not being let in and no planes had been sent to collect him. Malta, touted as another potential refuge, said if Gaddafi or any other Libyan official landed they would be arrested and “transferred immediately to the Hague”. Outside Africa, Venezuela is a possible destination. Hugo Chavez spoke out in support of his friend early this morning, and last week a Venezuelan envoy was in Djerba, talking to Gaddafi representatives. 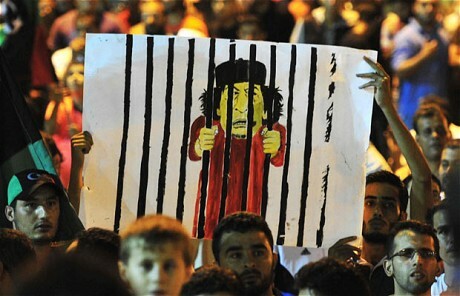 But escaping there would depend on Gaddafi being able to reach an aircraft – and with the rebels controlling the main roads and airport in Tripoli, and growing demands for the dictator to stand trial, he may have left it too late.